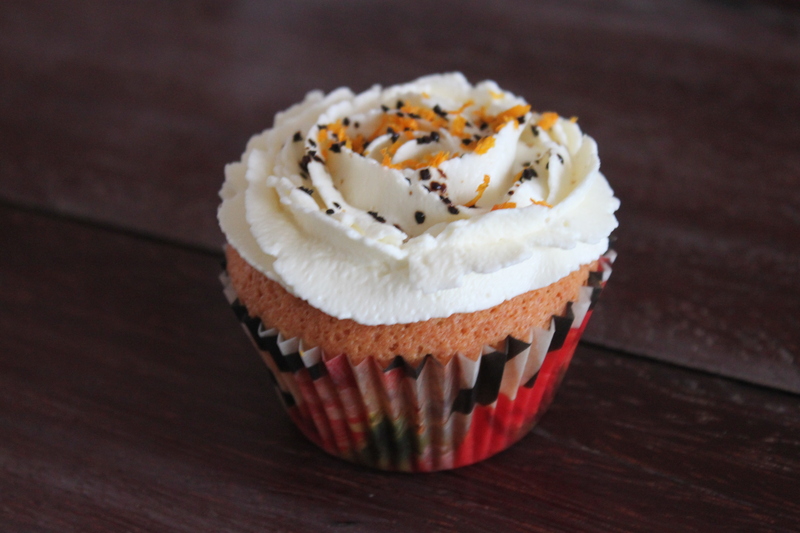 I don’t think that I should say an awful lot about these cupcakes, except from – try them, try them, try them! The combination of marzipan, raspberries and cream cheese frosting is just fabulous. Had the cakes not been for a friend, I might have eaten enough to get a horrible bellyache 🙂 Already trying to find an occasion to bake them again! Melt butter in a small sauce pan and let cool while preparing the rest of the ingredients. Grate the marzipan and set aside. Whisk together eggs and sugar until light and fluffy. Add baking powder and vanilla extract and whisk for a few seconds. Shift in flour 1/2 cup at a time and whisk to combine. Grate the marzipan and add to the batter. Whisk until combined, before pouring in the melted butter. Whisk until just combined. Line standard muffins tins with paper liners. Divide batter evenly among lined cups, filling each 1/3 full. Place 3-4 raspberries in the middle of the and cover with the remaining batter. The muffin forms should be 2/3 filled. Bake at 350F for 15-18 minutes or until a toothpick comes out clean. Remove the baked cupcakes from the muffin tins and place on a wire rack to cool. While the cupcakes cool, you can make the frosting. Whisk together cream cheese and vanilla extract until soft and fluffy. Shift in confections sugar and whisk until combined, soft and fluffy. Place the frosting in a party bag with a piping tip of your own choice (I have used Wilton M1) and pipe the frosting onto the cupcakes. If you think that the cupcakes look a bit plain and boring, you can decorate with all sorts of things. On the above picture I have sprinkled some freeze dried raspberry and raw liquorice powder on top. Below, I have use orange zest and raw liquorice powder. 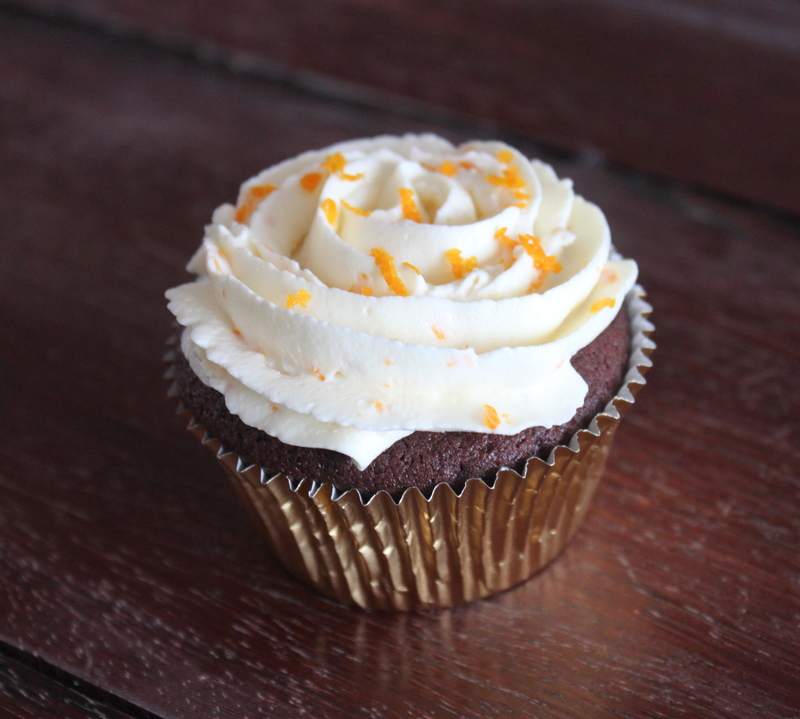 These cupcakes has a perfect combination of chocolate, cream cheese and orange – YUMMI they are delicious! Melt butter and sugar in a sauce pan. Stir to combine. When melted and combined, transfer to a mixing bowl and whisk at medium speed until cooled. Shift in flour mixture in four batches, alternating with the sour cream, and whisk until just combined. Chop the dark chocolate and fold into the batter. Line standard muffins tins with paper liners. Divide batter evenly among lined cups, filling each 3/4 full. Bake at 350F for 18-20 minutes. Halfway through, turn the muffin tin 180 degrees, to secure that the cupcakes are baked evenly. Transfer tins to wire racks and let cool for 10 minutes before turning cupcakes onto racks to cool completely. While the cupcakes cool, you have time to make the frosting. Place cream cheese and vanilla extract in a mixing bowl and whisk until soft and fluffy. Shift in confectioners sugar and whisk until combined, soft and fluffy. Fold in 3/4 of the orange zest. Decorate the cakes with the frosting and sprinkle the remaining orange zest on top. 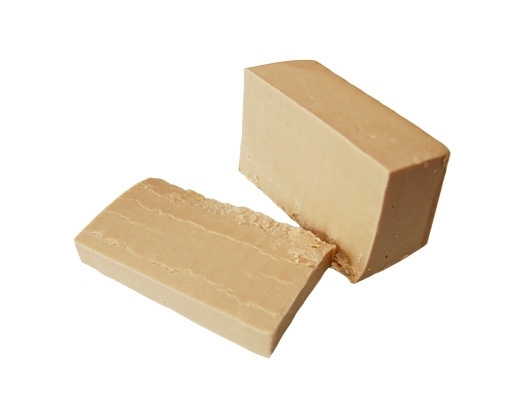 When we refer to almond nougat below, we don’t mean the soft nougat with nuts, but the kind made from almonds, cane sugar and cocoa butter (the picture below). Place the almonds and sugar in a frying pan and heat until sugar is melted. Stir to combined the almonds with the melted sugar. Transfer the brittle to a sheet of baking paper and let cool completely. Chop the brittle when cooled. Knead the 2/3 of the brittle and the zest from 1 orange into the almond nougat. Form to a ball and fridge for 10-15 minutes. 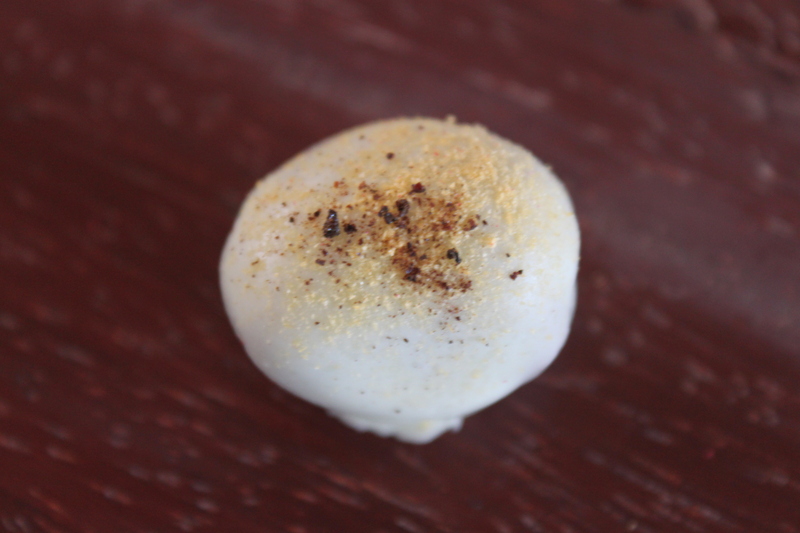 Divide the nougat ball into 20 equally sized pieces and form to eggs. Fridge again for 10-15 minutes, while tempering the chocolate. Place the marzipan in a bowl and whisk until it gets soft. Add 3/4 of the orange zest and 1 tbsp. cognac at a time. Whisk between each tbsp. cognac. 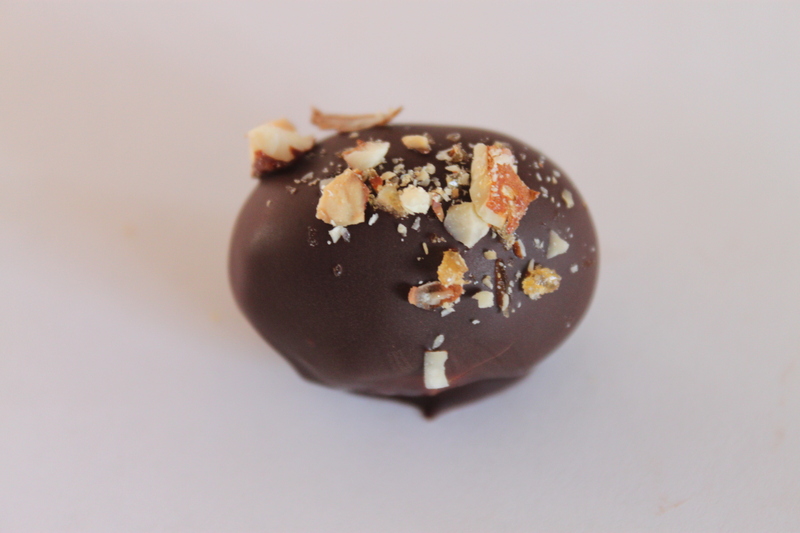 Chop the roasted walnut and mix into the marzipan. Form the marzipan to a ball and refrigerate for 20-30 minutes. When cold, divide the marzipan into 20 equally sized pieces and from to small eggs (approximately 1 tsp. each). Refrigerate again while preparing the chocolate. Chop the chocolate, melt and temper it, in a heatproof bowl over a pan of simmering water. Today it is Maundy Thursday – in Denmark this means that we have a holiday. Are you having a holiday in your country too? To get back to the easter egg production, we have made 5 different varieties which will all be coming on to blog in the following days. 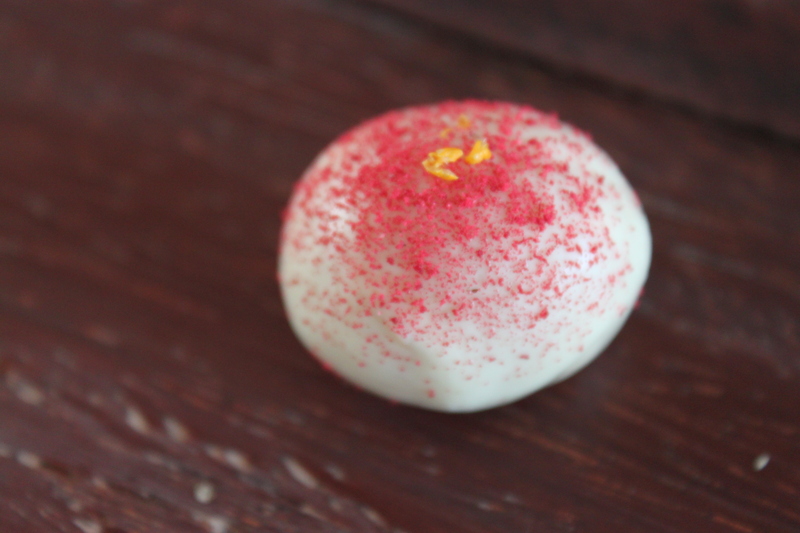 If you are curious, we can reveal, that we have made a variation with liquorice and white chocolate fudge – one with almond nougat, orange zest and almond brittle – one with marzipan, cognac, orange zest and roasted walnuts – and one with marzipan and freeze dried raspberries. Place the marzipan in a bowl and whisk until it gets soft. Add 1/2 of the lemon zest and juice, whisk again and taste. If think it needs more lemon, add the remaining zest and juice. Whisk until combined. Chop the white chocolate, melt and temper it, in a heatproof bowl over a pan of simmering water. Serve as a petit four for your easter guest together with at good cup of coffee, or wrap them in zellophan and use it as a hostess gift if you are going out. The recipe for these very very delicious and creamy fudge easter eggs are not our own, but once again it comes from our favorite chocolate blog. For those of you Danes who read our blog, you might have seen the recipe on last weeks postal cover, where Maja gave a few easter eggs recipes. If you love liquorice, white chocolate and fudge, these easter eggs are perfect for a good cup of coffee. Chop 1/2 of the white chocolate and place it in a heat proof bowl. Combine, sugar, corn syrup, cream and liquorice powder in a sauce pan and bring to a boil. Boil until the mass reaches a temperature of 235F. Stir occasionally to avoid that it burns. Pour the boiling sugar mass over the chopped chocolate and stir until the chocolate is melted an the the fudge evenly combined. Pour the mixture into a mold lined with baking paper and put it in the fridge overnight. Cut the fudge into 20 equally sized pieces and form to small eggs. Fridge while preparing the chocolate. Melt and temper the chocolate. 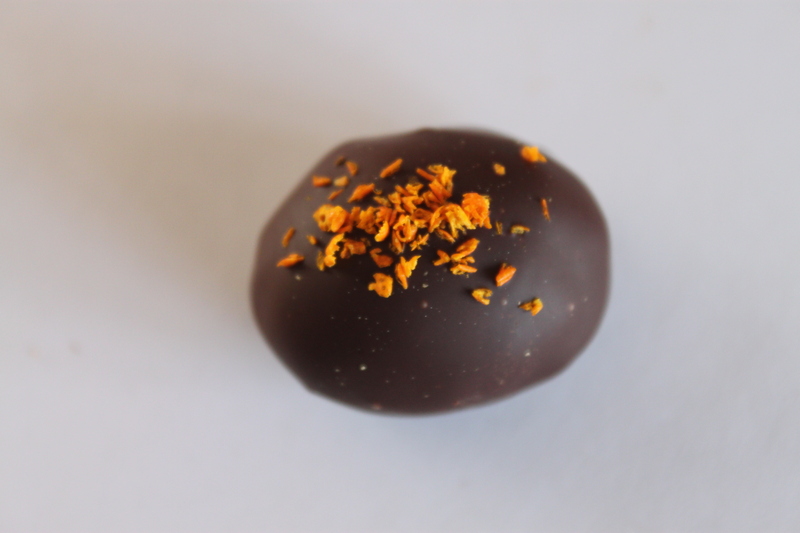 Cover the eggs with the melted chocolate and decorate with freeze dried passion fruit. 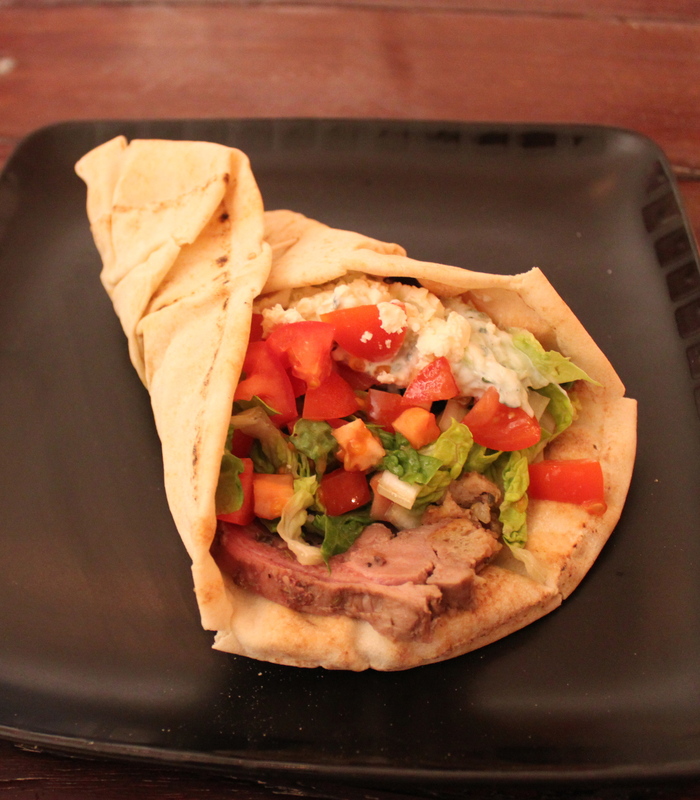 There are many ways to serve lamb, but if you want to try something less traditional, you should consider trying this fabulous greek lamb sandwich, which we made a while ago. When you have made the meat, it is as easy as boiling an egg, and you get all the good flavors from the greek cuisine combined with the charcoal flavor from the grill – a great great way to serve lamb. Grate the cucumber and sprinkle with salt. Let rest in a colander while chopping the vegetables. Chop the red peppers, tomatoes, red onion and olives into a small cubes. Drain the salted cucumber as much as possible and mix with the minced garlic and greek yoghurt. Refrigerate the tzatziki for 5-10 minutes. 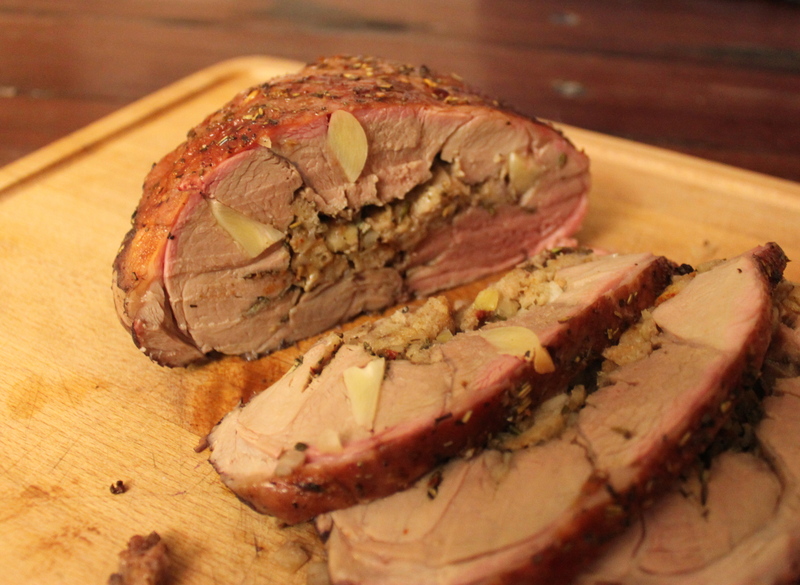 Cut the lamb roast into 1/2-inch slices and place 2 slices on each flatbread. Add sliced salad, tzatziki, chopped vegetables and some crumbled feta cheese.